The purpose of this study was to estimate the ability of ultrasound (US) to identify the presence of atypical muscle fibers around the roots of the interscalene brachial plexus and their relevance to the performance of continuous interscalene nerve block. Ultrasonography is a very effective technique for detecting the altered anatomy within the interscalene area and it helps to avoid complications like intraneural and intravascular injections. This study included 215 patients who received a US-guided interscalene brachial plexus catheter and underwent general anesthesia for shoulder surgery. All patients were examined using US for detection of atypical muscle fibers around the roots of the interscalene brachial plexus and for evaluating pain on the Numerical Rating Scale in the postoperative days. The presence of muscle bridges around the roots of the interscalene brachial plexus did not show any statistically significant differences in Numerical Rating Scale pain scores at rest and during movement on the second and third postoperative days. 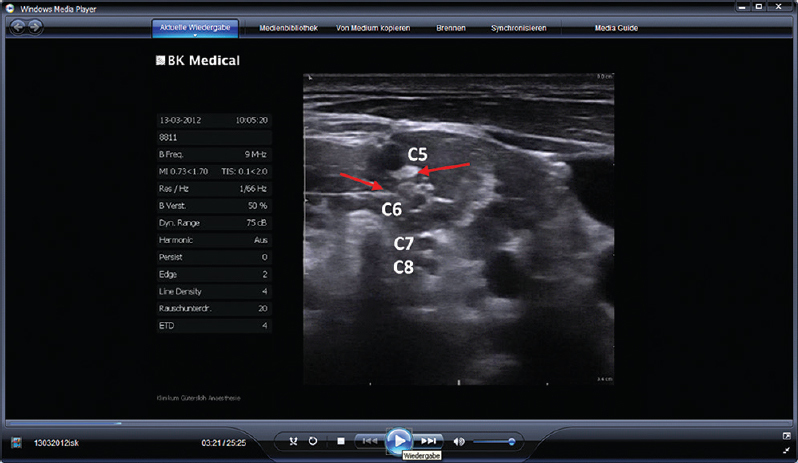 US is a very effective technique for detecting the altered anatomy and increases the efficacy of the interscalene nerve block. Advanced ultrasound (US) technology allows one to visualize the neural structures within the interscalene area, its surrounding structures at risk, and the effectiveness of local anesthetics and their dispersion at the time of injection in proximity to the nerves . Advanced US technology also allows one to estimate the location of the tip of the catheter using color Doppler and visualize the spread of the anesthetic in real time. US guidance has also been proven to facilitate the neural blockade as well as improve block quality ,. 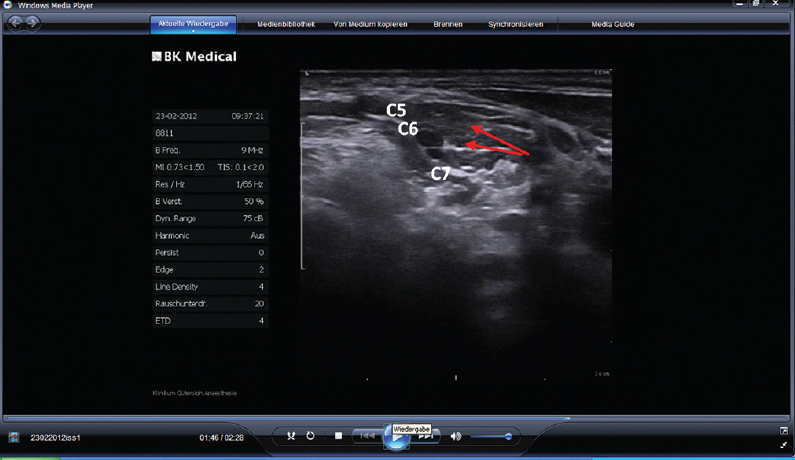 Ultrasonography has been used successfully to define the anatomy of the brachial plexus in the interscalene region allowing real-time imaging simultaneously with the block procedure and is particularly useful with altered anatomy . US technology is currently the only known method that identifies the presence of altered anatomy within patients. The altered anatomy includes the presence of atypical muscle fibers around the roots of the interscalene brachial plexus that may affect the dispersion of locally administered anesthetics. The rate of dispersion of these anesthetics is indicatively related to the failure or success of the nerve block. In addition, US technology provides the ability to mitigate complications such as intraneural and intravascular injections . This study was conducted at the Anesthesia Department of Gütersloh Klinikum from 2011 until 2015. The study included 215 adult patients who underwent shoulder surgery and received an US-guided interscalene brachial plexus catheter (ISBPC). The institutional purpose of this study was disclosed to all patients included, and written informed consent was obtained from them. All patients were examined with a high-frequency (>10 MHz) US transducer (BK Medical Medizinische Systeme GmbH, Quickborn, Germany) for examining the anatomy of the interscalene area pertaining to the presence of atypical muscle fibers around and in between the roots of the interscalene brachial plexus [Figure 1],[Figure 2],[Figure 3],[Figure 4],[Figure 5]. Figure 1: Atypical muscle fibers around the roots and between C5 and C6 and C7 and C8. The red arrows refer to the muscle fibers. Figure 2: Atypical muscle fibers around the roots and between C6 and C7 and C7 and C8. The red arrows refer to the muscle fibers. Figure 3: Atypical muscle fibers between C5 and C6 and C6 and C7. The red arrows refer to the muscle fibers. Figure 4: Atypical muscle fibers around and between C6 and C7. The red arrow refers to the muscle fibers. Figure 5: Atypical muscle fibers around and between C5 and C6. The red arrow refers to the muscle fibers. The 215 patients had received ISBPC, and general anesthesia had been given because of the beach chair position of the shoulder surgery. The patients were allocated into two groups (A and B) according to the presence of atypical muscle fibers around the roots of the brachial plexus. Postoperatively, the catheter was connected to a patient controlled analgesia device with a background infusion of 4 ml/h (8 mg/h) of ropivacaine 0.2% solution and incremental on-demand dose of 2 ml (4 mg) with a lockout time of 15 min. The patients were assessed within the first 3 postoperative days in terms of the Numerical Rating Scale (NRS) for pain at rest with movement at fixed time ranges. Data were analyzed using the XLSTAT program. The NRS for pain was compared using the Mood's median test by comparing the medians of both groups. A P value less than 0.05 was considered statistically significant. We identified two groups of patients: group A patients [(18.605% (40/215)], in which there were atypical muscle fibers around the roots of the brachial plexus (mean NRS score at rest 0.800 ± 1.285) and group B patients [81.395% (175/215)], in which there were no muscle fibers around the roots of the brachial plexus (mean NRS score at rest 0.589 ± 1.327). The NRS scores for pain at rest on the first postoperative day for both groups were comparable and statistically significant (P < 0.05). The NRS score for pain with movement on the first postoperative day and that at rest and with movement on the second and third postoperative days for both groups were comparable and statistically insignificant (P > 0.05). Only three complications were recorded in all 215 patients. Two of these complications were Horner's syndrome and the third complication was hoarseness of voice, which improved and disappeared after a reduction in the basal rate of the local anesthetic. 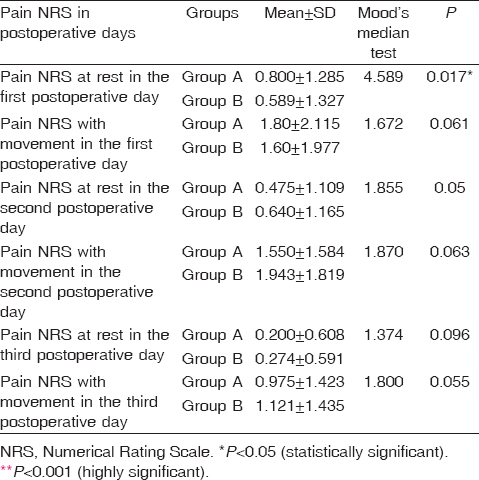 The difference between the two groups with regard to pain on the NRS at rest on the first postoperative day was statistically significant (P < 0.05). The differences in pain on the NRS with movement on the first postoperative day and that at rest and with movement during the second and third postoperative days between the two groups were statistically significant (P < 0.05)[Table 1]. This study enabled us to identify and describe altered anatomy within the interscalene area. We were able to evaluate and estimate the ability of US to facilitate and improve the interscalene nerve block quality, and mitigate any potential complications. In this study we observed the presence of atypical muscle fibers around the roots of the brachial plexus in 18.605% (40/215) of patients. These muscle fibers appeared not to have any relevant influence on pain on the NRS at rest and with movement at fixed times during the second and third postoperative days. Kessler and Gray  has observed anatomic variations in 13% (6/46) examined brachial plexuses. Three C5 ventral rami were seen passing over and three were seen passing through the anterior scalene muscle. Gutton et al. estimated that 33% (48/146) of patients showed an intramuscular passage of a root, whereas 8% (12/146) of patients showed a C5 root ahead of the anterior scalene muscle. These variations appeared not to have any relevant influence on the performance of the single shot interscalene block. In this study we recorded only three complications among all patients who received an US-guided ISBPC. Two of these complications were Horner's syndrome and the third complication was hoarseness of voice, which improved and disappeared after a reduction in the basal rate of the local anesthetic. Davis et al. has reported that the success rate for postoperative analgesia using US technology guidance only was 99%. Untoward events such as needle paresthesia and persistent neurologic deficits were lower than those on nerve stimulation and paresthesia techniques. US can be successfully used as the sole method for instruction signature based. Lapegue et al. reported that US imaging of the plexus has become a routine process in anesthesia examination for guiding nerve blocks. Liu et al. examined 257 patients enrolled in a prospective, single-blind observational study. All patients underwent a preoperative neurological examination before ambulatory shoulder arthroscopy with sedation and US-guided interscalene or supraclavicular block. Patients were followed up at 1 week and at 4–6 weeks postoperatively. He found that no patient suffered from postoperative neurological complications (0%) at follow-up. Alzahrani et al. has described the occurrence of delayed Horner's syndrome after an US interscalene brachial plexus block (ISBPB) in a healthy 29-year-old man who underwent elective arthroscopic repair of a left shoulder Bankart lesion. Gollapalli et al. reported an incident of delayed onset of true vocal fold paralysis with continuous interscalene brachial plexus block. In this incident a 51-year-old woman underwent left shoulder manipulation and lysis of adhesions with fluoroscopy and general anesthesia. Following her hospital discharge, ∼8 h after the initial catheter bolus the patient developed hoarseness, dysphagia, and dyspnea, secondary to left vocal fold palsy. The patient was admitted for observation and the catheter was discontinued with no intubation required. By the next morning, the patient's dysphagia and dyspnea had resolved and her hoarseness had improved. Ultrasonography is a particularly effective method for identifying and observing an altered anatomy within the interscalene area, such as atypical muscle fibers around the roots of the interscalene brachial plexus. These atypical muscle fibers appear not to have any relevant significant influence on the performance of continuous interscalene block, which has very low incidence of complications, therefore providing very effective postoperative analgesia for shoulder surgery. Hopkins PM. Ultrasound guidance as a gold standard in regional anaesthesia. Br J Anaesth 2007; 98:299–301. Kapral S, Greher M, Huber G, Willschke H, Kettner S, Kdolsky R, MarhoferP. 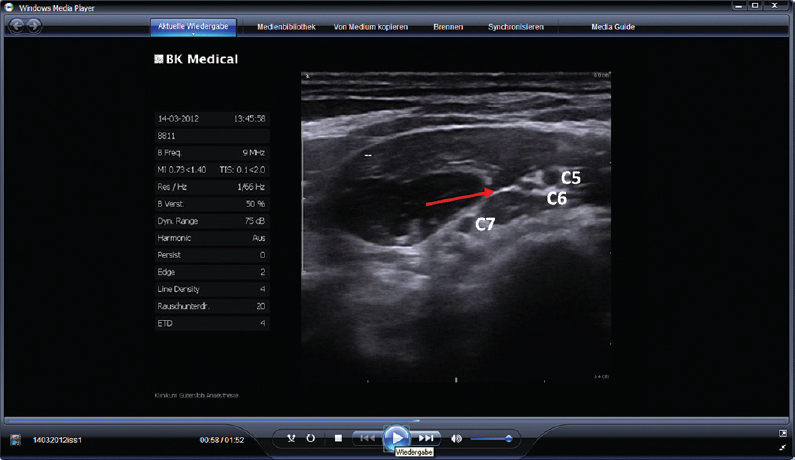 Ultrasonographic guidance improves the success rate of interscalene brachial plexus blockade. Reg Anesth Pain Med 2008; 33:253–258. Swenson JD, Davis JJ, DeCou JA. A novel approach for assessing catheter position after ultrasound-guided placement of continuous interscalene block. Anesth Analg 2008; 106:1015–1016, table of contents. Pellerin M, Kimball Z, Tubbs RS, Nguyen S, Matusz P, Cohen-Gadol AA, Loukas M The prefixed and postfixed brachial plexus: a review with surgical implications. Surg Radiol Anat 2010; 32:251–260. Abrahams MS, Panzer O, Atchabahian A, Horn JL, Brown AR. Case report: limitation of local anesthetic spread during ultrasound-guided interscalene block. Description of an anatomic variant with clinical correlation. Reg Anesth Pain Med 2008; 33:357–359. Kessler J, Gray AT. 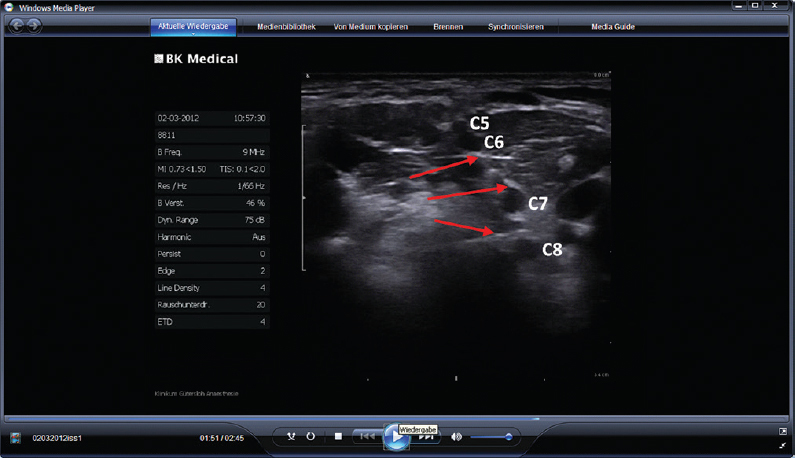 Sonography of scalene muscle anomalies for brachial plexus block. Reg Anesth Pain Med 2007; 32:172–173. Gutton C, Choquet O, Antonini F, Grossi P. Ultrasound-guided interscalene block: influence of anatomic variations in clinical practice. Ann Fr Anesth Reanim 2010; 29:770–775. Davis JJ, Swenson JD, Greis PE, Burks RT, Tashjian RZ. Interscalene block for postoperative analgesia using only ultrasound guidance: the outcome in 200 patients. J Clin Anesth 2009; 21:272–277. Lapegue F, Faruch-Bilfeld M, Demondion X, Apredoaei C, Bayol MA, Artico H, et al. 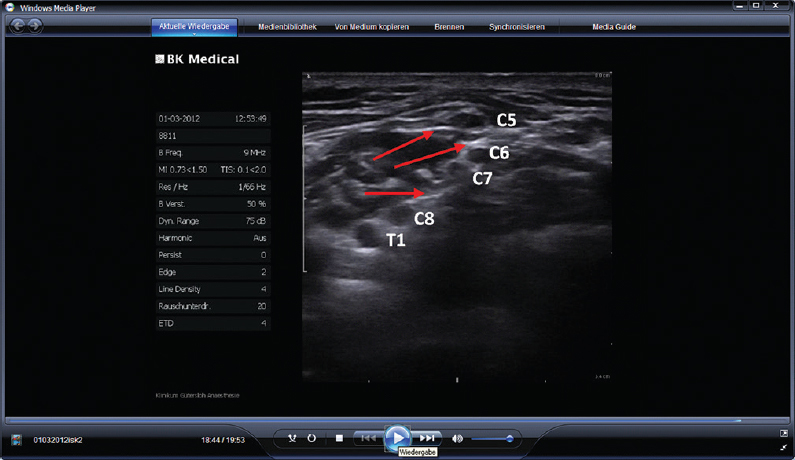 Ultrasonography of the brachial plexus, normal appearance and practical applications. Diagn Interv Imaging 2014; 95:259–275. Liu SS, YaDeau JT, Shaw PM, Wilfred S, Shetty T, Gordon M Incidence of unintentional intraneural injection and postoperative neurological complications with ultrasound-guided interscalene and supraclavicular nerve blocks. Anaesthesia 2011; 66:168–174. Alzahrani T, Alnajjar M, Algarni AD, Al-Ahaideb A. Delayed Horner's syndrome following ultrasound-guided interscalene brachial plexus block. Saudi J Anaesth 2014; 8:121–123. Gollapalli L, McKelvey G, Wang H. Delayed vocal fold paralysis after continuous interscalene level brachial plexus block with catheter placement: a case report. J Clin Anesth 2014; 26:407–409.